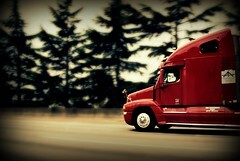 I just read an interesting article about how trucking fleets are using GPS to calculate their fuel taxes. Since fuel taxes are generally handled by the states and since truckers typically operate across state lines they often need to calculate their usage in various locales. GPS position reporting is a good way to do this as not only would it report your GPS location but it would also report the time for each position report. Ideally, you could automate this process with reporting transmitted as you go. It is likely that state and local governments will increase their use of GPS to support pay-as-you-go taxation paradigms. This can be an onerous administrative task. If you have a fleet of over 50 trucks, there is a good chance you have one person, perhaps making $40,000 annually, focused solely on this paper-intensive task. But the process can be automated if a company uses GPS/telematics devices in its trucks, along with fuel cards and IFTA tax reporting software (or a tax service provider that uses this kind of software). Then the mileage driven in each state and fuel expenditures for a particular vehicle can be automatically loaded into the software and the proper IFTA reports can be printed. The process becomes much less paper intensive. While a fleet operator would probably never buy a telematics solution solely to eliminate a clerical position, it can contribute to the ROI offered by telematics solutions.